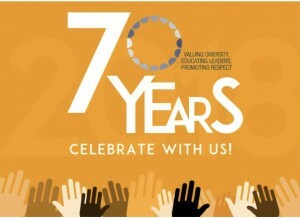 This year kicks off the 70th Anniversary celebration of the American Conference on Diversity (ACoD). For most of the organizational history, it was known as the National Conference of Christians and Jews. ACoD established its New Jersey office in 1948 and became one of the state’s earliest movements of resistance to fight bias, bigotry, and racism in schools, workplaces, and communities. About 43 NJ districts still operated segregated schools, despite a law that passed a year earlier making it illegal. The anti-Semitic bi-monthly Common Sense, headquartered in Union Township, was thriving with a circulation of about 50,000. Today, in one of the most diverse states in the nation, ACoD continues to be a bulwark of the values that have made American great. The organization receives calls daily requesting help from teachers, students, employees, and associations to address diversity issues that they have encountered. ACoD has engaged thousands in courageous dialogue to build an even stronger legacy of advocacy and social justice from generation to generation. We have reached a point in our history where those who believe in the promise of respecting differences must unite and resist the attack on diversity. As part of the 70th Anniversary “No Hate in Our State” challenge campaign, New Jersey Natural Gas has pledged to give ACoD $25,000 and is calling on NJ’s community to raise an additional $75,000, bringing the fundraising campaign total to $100,000! It’s a terrific opportunity to take a stand. Please make your donations here: http://americanconferenceondiversity.org/donate. The future of diversity and inclusion are threated by spikes in hate crimes in our area. But for the past 70 years, the ACoD has been an advocate, an educator, a facilitator, a motivator, and a convener that brings people together to promote respect, diversity, and inclusion. During this time of rising intolerance, inequality, and injustice, this organization stands for, actively helps build, and defends the ideals and standards that represent the best of American society. Please help the ACoD continue its legacy and reach this goal by making a generous donation of $35, $70, $100, or more to ensure today’s generation of leaders have more inclusive schools and communities. Our signature Lead for Diversity Institute has had more than 3,000 graduates; our Educators’ Institute has had 300-plus graduates from schools in 16 counties across the state; and our professional development services engage NJ’s top corporations/organizations and has reached more than 20,000 employees from various sectors. The demand to fight against hate is at an all-time high. Another way to celebrate the American Conference on Diversity’s 70th Anniversary and demonstrate your support of our continued work is to customize your social media profile picture here: http://bit.ly/2FnE0sP. The American Conference on Diversity is dedicated to building just and inclusive schools, workplaces, and communities through awareness, education, and advocacy. The nonprofit organization was founded in 1948 as the National Conference of Christians and Jews. Today the programs, services, and initiatives of the American Conference on Diversity are among the most important work focused on creating a more inclusive society. It is the unfinished business of living in a highly diverse nation: educating and empowering our next generation of leaders, enhancing our workplaces, and helping to create inclusive communities. Visit www.AmericanConferenceonDiversity.org to learn more.